Author Kevin Christofora, whose books encourage children to be accepting of others, touches upon the Syrian refugee crisis with a new Hometown All Stars player in his upcoming children’s book, ‘Amira Can Catch’. Author Kevin Christofora touches upon the Syrian refugee crisis with a new Hometown All Stars player in his upcoming children’s book, ‘Amira Can Catch'. 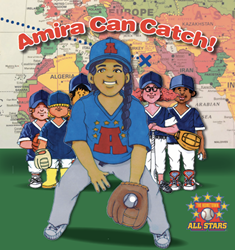 I want kids to be able to read ‘Amira Can Catch’ and be willing to befriend a new classmate or teammate, even if that person is from a different background. It’s not a new tale: there’s a new kid in school. She’s shy and a little quiet— but she blossoms into a joyful, silly child when befriended by some of the other kids. That’s the story of Amira, the new kid at school in the upcoming “Hometown All Stars” children’s book. Only, there’s one difference with Amira: she’s new because she left her home country of Syria over a year before. The Hometown All Stars series of children’s baseball books teach children a variety of lessons: from basic arithmetic to healthy exercise habits, there’s no shortage of things to learn. With Amira Can Catch, Christofora also makes a powerful statement about acceptance and inclusivity, in a time when it’s extremely important to impart those values. Additionally, with the book series translated into over 20 languages, children from many different backgrounds can benefit from these lessons. In Amira Can Catch, Amira struggles with spelling and math at school, and it could keep her from joining the team. Luckily, with some help for both her and the reader, she’s able to join the Hometown All Stars and play baseball with everyone else. Amira Can Catch aims to teach readers about Willie Mays and how to catch pop fly balls, as well as reading maps— as well as a number of other lessons. “I want kids to be able to read Amira Can Catch and be willing to befriend a new classmate or teammate, even if that person is from a different background,” says Christofora. Distributed by Midpoint Books, “The Hometown All Stars” series is currently available on Amazon, as well as thehometownallstars.com; Amira Can Catch will be available in September.